Popular participation is one of the hallmarks of modern politics. So why have democracy and democratic norms generally failed to take root in the Theravada Buddhist countries of South and Southeast Asia? This book explores traditions of Buddhist political thought in Sri Lanka, Myanmar, Thailand, Laos, and Cambodia. Matthew Walton considers each country's trajectory towards independence, the controversial issue of monastic political engagement, the influence of other political forces, and persistent attempts to restrict participation, even in contemporary democratic states. 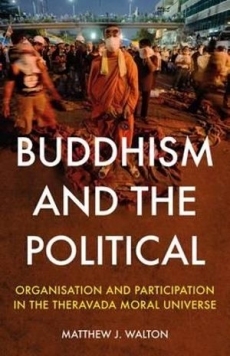 He also contextualises this landscape within the Theravada Buddhist arguments for and against greater political participation, probing the dualistic understanding of human nature that questions ability to self-govern while valuing moral improvement through free action. Secular rationales in favour of democracy are unlikely to be effective unless they consider the logic of the Theravada moral universe. To move forward, South Asian democracy supporters must not only heed Walton's assessment of the region's politico-religious nexus, but also engage with the fundamental ambivalence he identifies in Buddhist perspectives on the legitimacy of mass participation. About the Author: Matthew J. Walton is the Aung San Suu Kyi Senior Research Fellow in Modern Burmese Studies at St Antony's College, Oxford. His research focuses on religion and politics in Southeast Asia. His first book, Buddhism, Politics, and Political Thought in Myanmar, will be published in November 2016. Be one of the first to review the Buddhism & the Political.